When Italy's Sanremo Rally ended in victory for Frenchmen Didier Auriol and Bernard Occelli in their Martini-backed works Lancia, it could not have been a surprise to them that theirs was a triumph which was overshadowed by another. Spanish pair Carlos Sainz and Luis Moya got their Toyota Celica GT4 into third place, Sainz thereby scoring just enough points to clinch the title of World Rally Champion. The celebration in the Toyota camp that night was equalled only by that of the large contingent of visiting Spanish supporters, including the country's Minister of Sport. Before Sanremo there was a mathematical possibility that Sainz could be beaten for the title by Juha Kankkunen, but for that to happen Sainz had to score no more effective points and Kankkunen had to win the three remaining rounds, Sanremo, Ivory Coast and the RAC. Even then, their scores would have been equal, and Kankkunen would have taken the title by virtue of having scored the greater number of outright wins. It was a tall order, and one that hardly anyone considered any more than highly improbable. All Sainz had to do was to increase his score by just two points, the minimum he could gain, and he did precisely that in Sanremo by taking third place. That position actually brought him twelve points, but it also increased his number of scoring results to nine, and as the maximum number of scores to count at the end of the year is eight, he had to drop his lowest score, ten, achieved by his fourth place in the Safari. 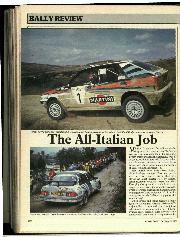 Lancia was also celebrating championship success, for Auriol's victory clinched the makes' title for the Italian team. When a tree is blown down by wind, it matters little whether its force was 40 mph or 80 mph. The tree is down, and that is that. 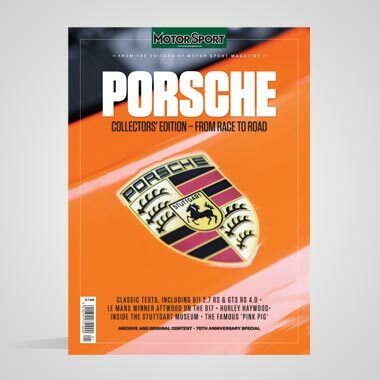 Similarly, winning margins in motor competitions are of little lasting significance and the main thing remembered is who won, not by how much. After Sanremo, Sainz' championship lead over second-placed Auriol was 45 points, but just two points were all he required to gain the title, irrespective of Kankkunen's scores. As it happened, Kankkunen did not win, so even those two points became academic, although it looked at one time that Sainz would not score anything at all at Sanremo. One can't help wondering whether, had that happened, Auriol might have been told to slow down so that teammate Kankkunen, the only driver with a chance of beating Sainz, would win. That's not an unkind supposition, but one based on incidents which have actually happened in the past. On the last stage of the Wednesday, with just the last night to go, Sainz rolled and was extremely fortunate to be able to continue with no greater loss than dropping from the lead to third place. His damaged Celica was restored before the final night, but he was unable to recover the time he had lost. Victory had slipped from his grasp, but he nevertheless became the new World Champion, and an eminently worthy one at that. Although the drivers' championship was the main point of interest at Sanremo, during the course of the event there was something else which made people sit up and take notice, and that was the performance of the works Ford Sierra Cosworth 4x4s. Again they had various problems, and of the three entered only that of Pentti Airikkala finished, in eleventh place, but whilst they were running they certainly made their marks, often putting up the best times on special stages. Malcolm Wilson was also most impressive and it was good to see a British driver doing so well in a British car. In the Group N category, Sierra Cosworth 4x4s finished first and second, driven respectively by Alessandro Fassina (10th overall) and Gwyndaf Evans (12th overall). Statistically, the result was not much to crow about, but the potential was certainly demonstrated and brought satisfaction to a team which had many new staff as well as a new car. Indeed, several of the mechanics were cutting their rallying teeth at Sanremo. Lancia, Toyota, Ford and Subaru were the main teams at Sanremo, whilst Ford, a Mazda, a Renault and a clutch of Lancias were contesting the Group N category. Among the ladies were Paola de Martini in her Audi and Louise Aitken-Walker in an Opel Kadett entered by GM Euro Sport. The latter added nine points to her score by finishing 18th, but her Italian rival failed to finish and scored nothing. Lancia's line-up consisted of works cars for Biasion, Kankkunen and Auriol, Jolly Club cars for Cerrato and Fiorio, Group N cars driven by Trelles and Del Zoppo and a Grifone Group A car by Liatti. Trelles' car and three others were prepared by Astra Racing, the outfit run by former driver Mauro Pregliasco. All four of them finished. Toyota also brought three works cars, driven by Sainz, Ericsson and Schwarz. Ford had Wilson, Airikkala and Cunico in their Q8-backed Group A cars and Evans in a Group N car, whilst a Fina-backed Cosworth was driven by Duez. Ford Italy entered a Group N Sierra Cosworth for Fassina; son Alessandro, not father Toni. 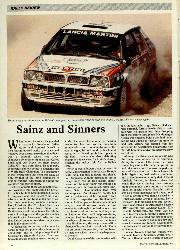 Also from Britain came two Prodrive-built Subaru Legacies for Alen and Chatriot. There were no team Mazdas, but de Mevius switched from Group A to Group N to drive a 323 for the Italian Mazda team. 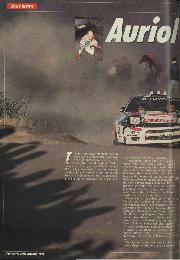 Other Group N runners included Oreille (Renault R5 GT) and the capable young Finn Tommi Makinen in a Mitsubishi Galant. Although its predecessor, the Rallye dei Fiori (Rally of the Flowers), used to be on surfaces which were predominantly dirt and rock, even snow and ice when it was a February event, the modern Sanremo Rally is a mixed affair. It spent a few intermediate years as a tarmac rally after the road surfacers got to work in the mountains behind Sanremo, but then went further afield in search of dirt roads. Indeed, on its first such foray it went right across the entire width of Northern Italy, from the French border in the West to the Adriatic coast in the East, its distant sub-headquarters being in the Republic of San Marino, not far short of the resort of Rimini. Today, it does not go quite as far as the Adriatic, but the long motorway sections are still there, to get competitors from one group of special stages to the next. There were stops this year at Arezzo and Perugia, but the rally still began and concluded in the now-tarmac complex of mountain roads close to Sanremo, in traditional Rallye dei Fiori country. We are told that next year it will go as far as Rome. 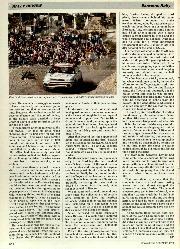 The use of both tarmac and dirt stages calls for extra work in car preparation, not to mention tyre selection, but at least they were grouped in such a way that there were long road sections in which ample time was available for the switch from one type of suspension to another. Although there were plenty of rest stops, the rally did not follow the daylight-only trend which has been produced by FISA's rest requirements. 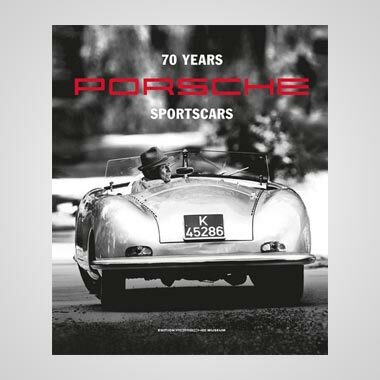 Indeed, apart from a three-quarter-mile "superspecial" on the Sunday afternoon, the rally began at midnight and the first four tarmac stages were all held in darkness. Six hours of road section later came six dirt road stages in the daytime before a 15 hour stop at Arezzo. The next leg, spanning eleven stages, ran from 7 am. to 6 pm. and ended at Perugia where there was a 12 hour stop before five early morning stages and the five hour trek back to Sanremo. The final leg was in the area of the first and was also held at night, eight stages being held between midnight and the 10 am. finish on the Thursday. The opening stage, near the sea at Ospedalefti and just a few miles along the coast from Sanremo, was a very brief affair and it came as no surprise that six drivers shared the lead when it was over, each with a penalty of 1 m 09s. However, the short journey there was troublesome for some, especially Alen whose Subaru refused to start in the closed park. A 30 second penalty for failing to move off under the car's own power was followed by a further 1 m 30s road penalty for arriving 3m late at the first stage after having the car's engine management computer replaced. Although rain clouds were moving about, the weather was dry in the hills for the night's tarmac stages. Perhaps it will cause some nostalgia if we say that the first went from Ceriana through Baiardo and San Romolo to Perinaldo, the second from Pigna over the Langan to Molini di Triora, the third over the Colle d'Oggia and the fourth over the Passo Ginestro, all roads which have served the rally well since they were little more than goat tracks. 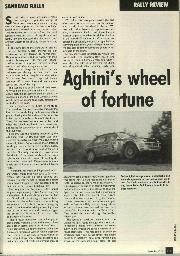 Alen lost more time in the first stage due to loss of power steering, whilst Airikkala's rally almost came to an end when plastic body parts caught fire. It seems that a seam on the lightweight exhaust pipe cracked and the escaping hot gas ignited the plastic. When they realised what had happened they stopped and quickly put the fire out, but the biggest problem had been the choking fumes. Co-driver McNamee was sick and Airikkala felt really ill for some time afterwards. It wasn't a good night for the Ford team, for Wilson had a spot of brake trouble whilst Cunico had his throttle cable break. Eventually he rigged up a length of wire to use as a hand throttle, but he lost about half an hour and exceeded his maximum lateness. Chatriot lost his clutch due to distortion and break-up of the aluminium centre spline. He was able to struggle onwards to have it replaced, but the whole operation took so long that he, too, ran out of time. However, the exclusion would not become effective until the end of the leg, so the Subaru team decided to keep Chatriot going in order to further test the car and the tyres. In the morning, after the rally got to the dirt stages, Alén lost his drive when changing down to first gear for the exit from a hairpin. 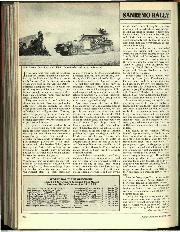 There was a considerable bang at the time, and it was at first thought that his clutch had failed in the same way as Chatriot's, but it was later found that the gearbox had failed. Actually, Alén had inadvertently selected reverse instead of first, but before anyone starts blaming the driver for what seems to have been a novice mistake, let us explain. On road cars there is a block of some kind to prevent accidental selection of reverse, and one has to depress or lift the gear knob, force the lever against a firm spring, or even lift a latch before reverse can be selected. On the Prodrive Subarus this block has been removed, and there has been no trouble during testing or even in practice. However, in the heat of a rally, when grabbing for first after hard braking into a hairpin, it's not so easy to be as precise, especially as the lever travel distance between first and reverse is very small on the Subaru. The moment reverse was selected, that gear disintegrated with a bang and, although Alen managed to struggle off the stage, within a very short time the broken pieces had destroyed the other gears. The actual cause was not fully recognised until Britain's Audi Sport Rally the weekend after Sanremo, when the very same thing happened. For the Lombard RAC Rally, the Prodrive Subarus will have reverse blocks in their gear selector gates. Fiorio rolled on SS.8 but continued having lost no more than about a minute, whilst Evans, although he lost a couple of minutes and dropped from 2nd to 4th in Group N, was actually moving up in the general classification and, having started at number 51, was looking forward to restarting in 17th place and having less dust to face. After that second leg (the superspecial alone had counted as the first) Biasion led in his Lancia, but Schwarz, Sainz and Auriol were only 7, 11 and 22 seconds behind respectively, followed by Kankkunen who was 1 m 05s behind the leader. But things began happening again very early in the third leg, the first incident when Schwarz went off the road, bent a cross member and damaged his suspension. He only lost about a minute, but the car handled badly for the rest of the day and the Toyota driver lost more time as a result. Meanwhile, team-mate Sainz was gradually increasing his pace, and on SS.14 he moved into the lead, eight seconds ahead of Biasion. Wilson continued to make several best stage times, but collected a road penalty after stopping to have his gearbox replaced. Aitken-Walker had her exhaust pipe dislodged on a somewhat rocky stage, and it got so close to a half-shaft that its gaiter was burned through. 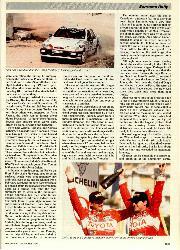 Sainz increased his lead, especially when Biasion hit a rock and punctured his front right tyre. He continued on the flat, lost about a minute, and later had to have the suspension and half-shaft changed on that corner or the car. Prior to the return journey to Sanremo, Sainz had increased his lead to 1m 15s, but by this time it was Kankkunen behind him, Biasion having dropped to third place, three seconds behind his teammate. Wilson continued to make excellent times, aided by new brake parts which had been flown in overnight from Boreham. Alas, he stopped some 6 miles into SS.25 after a nudge with a bank caused a front upright to break and the whole suspension to collapse. Airikkala had to stop for a front differential replacement and was 13 minutes late (6m 30s penalty) at the start of SS.25. On the very last stage of the fourth leg, sudden drama changed everything. 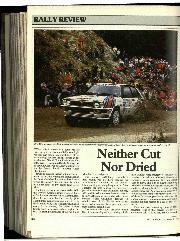 Little over half a mile after the start, Sainz slid wide on a slippery, 3rd gear right-hander, hit a tree and rolled. After help from spectators, he got going again, but with a broken rear screen, a rear wheel flapping uselessly and about two and a half minutes added to his penalty. The fast bend was a tricky one indeed, but when Kankkunen came by he saw the efforts to get the Toyota going and, thus warned, he slowed. By the time Biasion came, the Toyota had departed, but the Italian driver said that he was momentarily distracted by marks on the road and what he described as debris from the Toyota. He too went off the road, causing so much damage to the car that the only course was to abandon it. The final leg started with Auriol leading Kankkunen by 16 seconds and Sainz another 40 seconds behind. Sainz' car had been completely restored after his roll, but he had to consider very carefully whether it was worth going all out to make up 56 seconds in about 110 miles of tarmac stages. It would be very nice to add to his list of victories, but even more important was winning the championship and he could do that simply by holding on to his third place. He chose the latter course, although he did make one fastest time during the night. His team-mate Schwarz, having had completely new suspension fitted, was much happier not to have to cope any longer with the effects of his earlier accident, but on stage 33, the last but one, he hit a solid bridge parapet very hard and went no further. Prior to that, he had been fifth. That was about it, except that the simple incident of a wild boar darting across the road almost changed the course of the event further. The animal chose to cross just in front of Auriol, who said that it was pure luck that he didn't hit it. 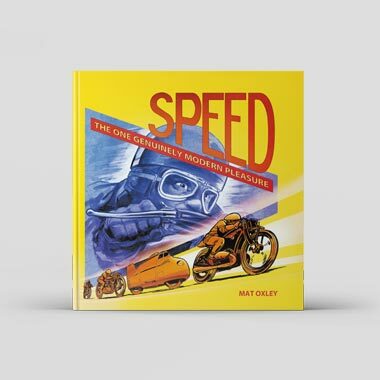 He had no chance to take any avoiding action, and had he been a split second earlier on the road he would have hit the animal and would certainly have gone no further.